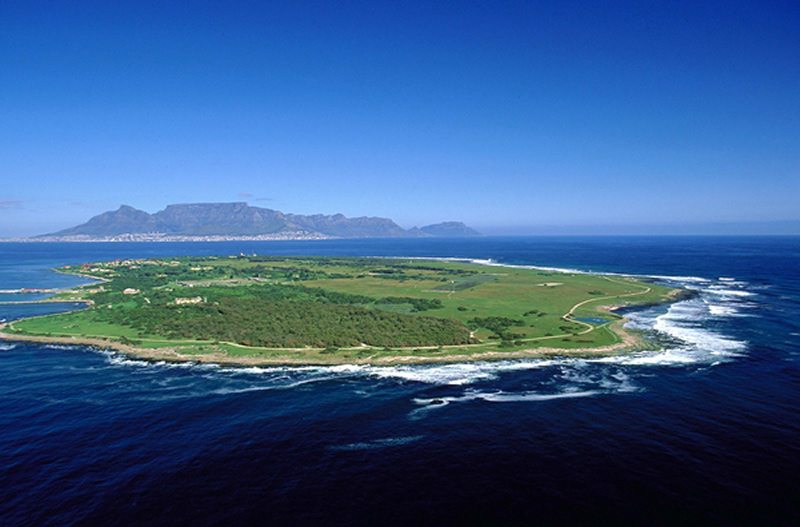 Robben Island is a UN World Heritage site and takes its name from the Dutch, meaning “Seal Island”. It is about six square kilometres in area and lies in the Table Bay region, 6.9 km west of the coast of Bloubergstrand, Cape Town. Robben Island is famous for its political history and Nelson Mandela, who spent more than twenty years of his life imprisoned here. The political struggle against the Apartheid regime came to fruition due to the efforts and hardships endured by Robben Island’s political prisoners. Today, the island stands testament to the victory of good over evil and is considered a symbol of freedom. Robben Island was being used as a prison as early as the 17th century when the Dutch first began to banish their political prisoners and Muslim leaders from the East Indies to this secluded island. In 1969, a shrine was built on the island in the honour of Sayed Abdurahman Moturu, the Prince of Madura. This shrine is called Moturu Kramat and it was common practice among Muslim prisoners to visit the shrine before leaving the Island. Rebellious Xhosa chiefs during British rule were also shipped off to Robben Island. From the mid-1800’s, all sorts of outcasts, criminals, prostitutes, lepers and the mentally ill were also sent to the island. All of these people were subjected to cruelty and abuse. The island also found use as a military and naval base. The South African Prison Department officially took over the Island in 1961 and built a maximum-security prison here. This prison is famous for the brutality and inhumane treatment that the prisoners received. Visitors were allowed only once a year and children under 16 years of age were not allowed to visit the island so the inmates never got to see their children grow up. Even letters were restricted to two a year. The inhumane treatment intensified further in 1971 and the political prisoners were isolated and subjected to harsh beatings and physical labour in the lime quarry. Food, bedding and clothing were insufficient and they had to endure long periods of solitary confinement. The inmates’ conditions were eventually improved due to hunger strikes, legal action and international pressure. In 1991, all of the political detainees were released from Robben Island, and in 1996 the common-law prisoners were also moved to the mainland prison and Robben Island prison was formally closed. Today, the Robben Island prison has been converted into a museum and is a popular tourist attraction. Daily tours to the island are available. Tickets cost R150 and can be purchased from ticket counters at the Nelson Mandela Gateway on the V&A Waterfront. A thirty-minute ferry ride from the Waterfront takes you to Robben Island’s tiny harbour. You can buy drinks and snacks on the ferry. The ride tends to get a bit rough on windy days and sometimes the trip gets cancelled due to severe winds. First-time visitors should arrive 20 minutes early in order to enjoy an extremely interesting interactive exhibit in the waiting hall about the prison’s history. When you get off at the harbour, a bus tour will take you to historic landmarks like the lime quarry, the kramat shrine, the leper graveyard and a church that was used by the prison wardens and their families. On the road to the village centre, you will also come across old Sailboat cannons. Most of the buildings on Robben Island are from the Second World War era, with 9.2-inch guns and bunkers that were originally a part of the armaments erected to defend Cape Town. You will also encounter a lighthouse that was built to warn ships of the rocky waters around the Cape. This coastline is famous for shipwrecks as well. During the bus ride, a guide, probably a former inmate will brief you about the history and the details of the places you see. This provides a unique experience of interacting first hand with someone who has actually experienced history in the making at Robben Island Prison. The bus stops at the limestone quarry where Nelson Mandela and other prominent ANC members spent many years of their lives doing harsh physical labour. There’s a cave at the quarry where prisoners could rest for a while, unspotted by the guards. This cave is an institution in its own self, as it became common practice for some of the more educated prisoners to teach others how to read and write by scratching in the dirt. Complicated subjects like History, politics and biology were also tackled at this phenomenal “prison university”. It was in this very cave that a good part of South Africa’s current constitution was written. The last stop on this trip is the maximum-security prison. Here you will take the Footsteps of Mandela tour in the notorious B-section of the prison. All the cells are locked and empty but Mandela’s sparse cell is kept open for the visitors. The A-section of the former prison houses the Cell Stories exhibition that evokes the meagerness of prison life. Loaned personal items of former prisoners are on display here. An amazing saxophone crafted from found bits and pieces by an inmate is also on display, and is still in working condition. There is a photograph display in the communal cells called The Smuggled Camera Exhibition. The photos on display have been contributed by former prisoners who managed to slip cameras onto the island in the late 1980s. Watching these enlarged photos is a unique, heartwarming experience, giving an indication of the inmates’ solidarity, friendship and a common hope for better times. Robben Island was once a haven for seals and ocean birds but the wildlife was ruthlessly plundered for fresh seal meat and penguin eggs by sailors when the Cape was originally discovered. Much has been done in recent years to restore Robben Island’s wildlife and ecology to what it used to be centuries ago. In 1991 the northern part of the island was declared a bird sanctuary. Buck, ostrich, and rabbits are easily spotted on the island. The entire trip lasts three and a half hours and is a unique experience. A trip to Cape Town is incomplete without visiting Robben Island as it has played a very important role in restoring freedom and democracy to the South African Nation.